My little nephews love playing with their X Box and PS3. It’s a bit sad how they will never experience the joy of playing with regular dolls or action figures, but I guess it’s cool for them to, at such a young age, enjoy gaming consoles that transport them to realistic distant worlds. Apart from computer gaming, they also enjoy playing musical instruments and having DVD marathons of Avatar: The Last Air Bender (the animated series, mind you, not the god-awful movie adaptation by M. Night Shyamalan). My sister told me all about her children’s demanding lifestyle in the bedroom, and I decided they simply must have kids futon bunk beds. 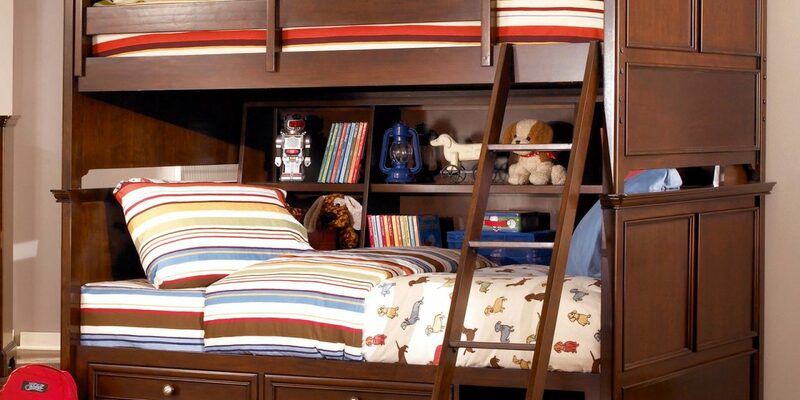 Bunk beds are good ideas for people who want to save space, especially for rooms that have more than one inhabitant. While it may look good to give your children two single beds each, using a bunk bed instead would give the same kind of sleeping set up although with less space used up on the floor area. As such, the bedroom will be much more spacious and you will have more room to put other furniture, like cabinets or bedroom couches, or just free area to move around. It also doesn’t hurt that bunk beds also come in different and handsome designs. 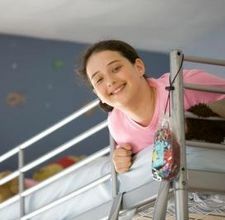 Bunk beds are usually made with equally sized bunks that accommodate the same size mattress and, correspondingly person. 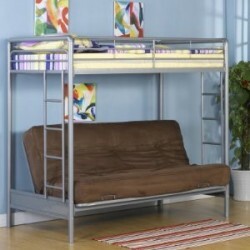 Futon bunk beds, however, have a bigger bottom bunk space than the upper bunk because of the fact that a futon mattress is utilized on the bunk below. Wooden futon bed bunks can be as big or as small as you want them to be. A single size bed on the upper bunk would mean a lower bunk with a double futon mattress capacity, while a double mattress on top implies a queen sized futon mattress below, on so forth. Despite having an overabundance of space, you’d less likely need sofa or other seating furniture when you use futon bunk beds with mattress for your bedroom. 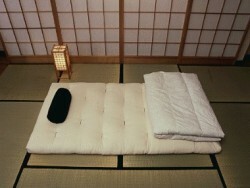 As most of us already know, a futon is a traditional Japanese style mattress which was originally referred to as shikibuton. This type of mattress can be folded into a kind of seat which can either be placed simply on the floor or even mounted on a frame. Futons are similar to daybeds, although the former is better since it can be folded out to its full extent as a regular mattress, unlike the latter. Futons are sold today components of sofa or other seating furniture which is specially crafted so that a homeowner can fold it into a full bed frame that can accommodate a fully extended futon mattress. Bunk beds with futon bottom are also crafted in the same manner which allows the futon bed to be used both as a seating and sleeping implement, depending on the needs of the persons using it. As such, it would be a great addition to your children’s bedroom where they can utilize such lower bunk as a couch while playing their favorite video games, watching television programs, or even just hanging around the bedroom. My nephews always thank me for the “futon” suggestion I made to their mother and say that they have since been able to do more with the new found space in their bedroom. As such, apart from children, I also think that bunk beds will work on grown-ups, perhaps in dormitories or other living spaces where people share rooms. Futon bunk beds are smart, innovative, space-saving and handsome pieces of furniture that would make the most out of small studio type spaces. The ever-growing complexities of modern living have significantly changed the way people spend their time at home. For people who rent in the city, an entire apartment room is all they will ever need (or sadly, afford) to eat, work, and sleep in when away from work. If you live in your room with someone else, utilizing a futon bunk bed for adults would free up a lot of space and even add to the aesthetic value of the entire set-up.